Ask a feminist: Can I prefer traditional gender roles and still be a feminist? So the other day, I had the opportunity to Skype lecture a few undergrad gender studies classes (which inspired this post). There was a large question and answer portion to the lecture, which I rather liked, as I love giving unsolicited advice to anonymous people (if you remember, I couldn’t see the students although they could see me, so it was like I was giving advice to a blank computer screen). One question that came up again and again was the question of whether one can be a “good feminist” while still enjoying traditional gender roles. 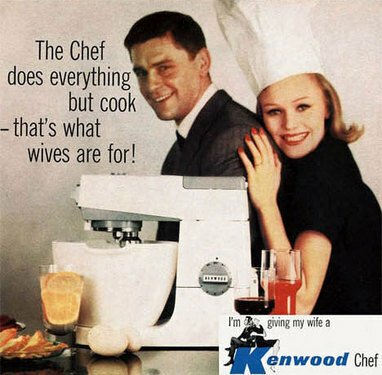 Vintage advertising is a veritable goldmine of sexism! There’s nothing wrong with doing things that are traditionally gendered. Rejecting a behavior because it’s traditionally feminine is probably just as bad as accepting it for the same reason! But I totally understand the concern. For example, I lived with a boyfriend for a while, and I cooked us dinner every night. I enjoy cooking for people who enjoy my cooking, and growing up, one way my mother showed that she cared about us was by making sure we had a healthy, balanced meal on the table every night. To me, this seemed like the only appropriate thing to do. But I did wonder about my decision in the context of feminism. I don’t think my boyfriend expected me to cook every night – in fact, he probably would have preferred if we’d ordered takeout every now and then so he wouldn’t have to do so many dishes! And since he wasn’t a good cook (also potentially a gendered thing, as his mother, who did the cooking in his house, never taught him), asking him to cook wasn’t really an option. Now, was my behavior gendered? Sure. I learned how to cook from my mom, who placed importance on cooking and cleaning because her mother was bad at both (my nana grew up in an orphanage so never really had a solid role model when it came to things like parenting and running a household). That’s pretty gendered. Comic from Cyanide and Happiness. But as a woman, choosing to do the “feminine” thing is not necessarily antifeminist – I mean, none of us live in a vacuum, so there are going to be things that you like that are gendered. If you identify more with the parent of your gender, you might come to emulate these gendered behaviors, like I did with cooking. The problem arises, of course, when people start to place expectations on their partners solely based on their gender. I think that’s where the above questions differ – the first asks about “believing” in gender roles as “not necessarily a bad thing,” which implies a belief in the system as a whole, while the second seems like more of a personal, individual question. If a man expects his girlfriend to take care of all of the cooking and cleaning, even though they both work the same amount of hours a week, that’s a problem. If a woman expects her husband to automatically take care of cleaning out the gutters and mowing the lawn even though he’s lived in an apartment his whole life and has never done either, that’s a problem too. In a situation where two people are living together, it’s definitely a good idea to have an honest discussion about household duties before moving in. What chores does each person prefer? Which would they rather not do? Which are they clueless about? What kind of standard of cleanliness does each person adhere to, and what is the lowest standard they can abide? Having these conversations can help prevent people from making (often gendered) assumptions about who will do what in the household. In the question about a girl cleaning her boyfriend’s room, I’m honestly torn. I understand the “oh my god this place is disgusting” impulse that girls sometimes get when encountering “boy” mess. I have forcefully cleaned my brother’s car more than once because its filth was out of control (he’s a rock climber, so he tracks in dirt and leaves on a regular basis). Each time I spent hours vacuuming, disinfecting, washing, deodorizing, and polishing his dirt-covered car. One time I cleaned it with him (I would have done it on my own, but he wouldn’t let me because he thought that’d be weird) and one time I cleaned it while he was on a business trip and had left his car at our parents’ house. In these cases, his mess did not bother him, and I cleaned the car based on my own preferences. When it comes to cleaning a boyfriend’s room, it would depend heavily on each person’s perception of the situation. Is the boy messy because he’s used to someone cleaning up after him? Is that someone his mother? Does the girl spend a lot of time in his room, and does she find the mess objectionable? I don’t think it would be out of line for her to ask him to make sure the room is neat or that the sheets have been recently washed when she comes to visit – if the mess makes her uncomfortable, it does seem that it would be his responsibility to make sure that she’s comfortable when she visits. On the other hand, is she cleaning because she does not want him to live in such a mess, even though he doesn’t seem to mind it? But yeah. If you’re a girl who loves to bake, awesome. Send me cupcakes. If you’re a guy who takes pride in changing your own oil instead of paying someone else to do it, that’s awesome too. Just don’t judge your friends’ relationships where perhaps the woman earns more money and the man is obsessive about making sure the laundry is sorted correctly. Don’t snarkily giggle at relationships where the man is better at singing the baby to sleep and the woman takes out the garbage every evening. What do you think? What are your experiences with gender roles in relationships? Want to ask a feminist? Post your questions in the comments, or do an anonymous ask on my tumblr. I definitely related to this post on a personal level. I am a stay at home parent (I try to refrain from using SAHM as a label) people constantly assume, me living this gender role, is in conflict with the work I do with “We Are More”. The way I see it, fighting for your children’s future, should be at the core of every parent’s philosophy.